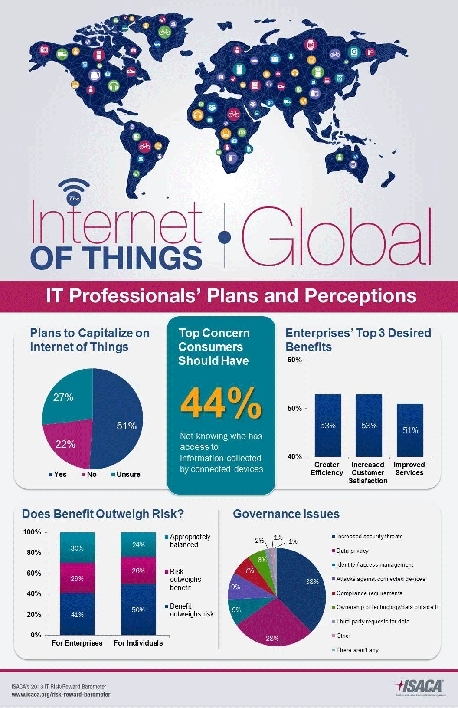 US — Almost all ( 99%) IT professionals worldwide believe the internet of things poses “some type of governance issue,” according to the Information Systems Audit and Control Association (ISACA)’s 2013 IT risk/ reward barometer survey. The survey, taken by 2,013 ISACA members from 110 countries and over 4,000 consumers from UK, US, India and Mexico, examined the perceived risks and rewards of the internet of things, big data and BYOD (bring your own device) among IT professionals and consumers. The survey also revealed that only 41% of IT professionals believe the benefit of the internet of things outweighs the risk for enterprises. This statistic improves when considering the benefits for consumers: 50% of IT professionals believe the benefit outweighs the risk in this case. The top governance issue, according to IT professionals, is increased security threats ( 38%), followed by data privacy ( 29%). Among consumers, the biggest concern is that someone will hack into their device, though IT professionals believe that consumers should be most concerned about not knowing who has access to their information, and not knowing how that information will be used. Links to global results, as well as results broken down by country (consumers) and region (ISACA members) can be found here.